We are happy to announce that Nathaniel Bennett successfully completed his Private Pilot Practical test on Saturday, May 12, 2018. Congratulations, Nathaniel. Congratulations to his instructor, John Pitkin, as well. Well done gentlemen !! Josh Stone completed his check ride today, Tuesday, April 24, 2018, with Brad Smith. I don't know which one has the best smile. Josh's comment after the check ride, "Smooth as butter ". Not sure what that means but it must be good. Congratulations Josh, well done. 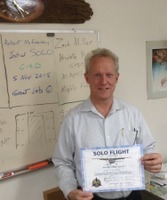 Congratulations to his instructor, Dennis Mathis, for successfully instructing another private pilot. Last evening, Tuesday, November 28, 2017 at around 1650, Josh Stone unabashed and unafraid, flew the mighty Cessna 150 in the pattern without any assistance. He did remark how the Cessna seemed to climb a lot faster without his instructor on board. Good job, Josh. You have now joined the unique league of AVIATORS !! Tyler successfully completed his check ride for his Private Pilot certificate today, Thursday, March 1, 2018, despite the sale of the plane he trained in and postponed check ride dates! Well done Tyler. Congratulations to Don Reeder for shepherding another one through the private pilot wickets. On the morning of Friday, June 30, 2017, unbeknownst to other pilots in the pattern at Majors Fields in Greenville, TX, one each Tyler Sanders was let loose at the controls of the Harvest Aviation Cherokee 140 for his FIRST SOLO flight. 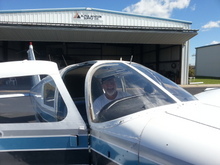 As you can see from the photos provided by his instructor Don Reeder, Mr. Sanders is sporting the very recognizable and not uncommon "post-solo grin". 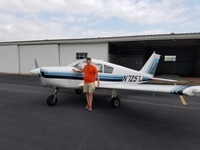 Tyler was a student in the Majors Flying Club 2016 Ground School class and is taking advantage of the flight training offered through our flying club to qualified club members. 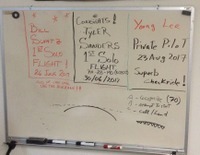 Congratulations Tyler on the singularly unique milestone of every pilot working toward their private pilot certificate. Well done Mr. Reeder. Two student solo flights in the same week of the same month. That might be a first for the club. Now stop it, I am tired of updating the website! 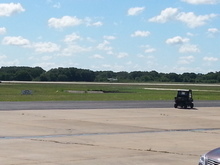 On an evening in the early summer 2017, Mr. Bill Schatz, a member of the Majors Flying Club, did successfully attempt and complete his FIRST SOLO FLIGHT followed by three successful landings. The sunset was particularly brilliant that evening as his instructor Don Reeder documented the memorable event and the post-solo grin in the pictures below. 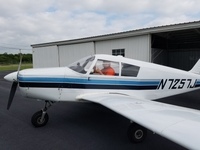 Bill was a student in the Majors Flying Club 2015 Ground School class and is taking advantage of the flight training offered through our flying club to qualified club members. Congratulations Bill on taking the mighty Cessna for a spin around the pattern without the aid and guidance of your instructor. 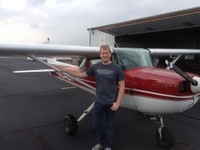 Congratulations Mr. Reeder for getting another student to their first solo. On the windy and gusty afternoon of Wednesday, March 29, 2017, Mr. Tom Hubert passed his check ride with FAA Designated Pilot Examiner Brad Smith. Tom's instructor was Don Reeder. We all recognize that smile! Well done Tom. Congratulations to Tom Hubert who soloed the Cherokee 140 on May 3, 2016. It was a perfect weather day to solo. Tom is a graduate of the Majors Flying Club 2015 Ground School and yet he came back for more! Tom did a great job and the plane is usable for future flights! According to Tom, "it was a piece of cake". Yeah, maybe, but what about the flight? Kudos to Tom's instructor, Don Reeder. Don was as nervous as an "expectant father" but his student came through for him and that counts for a lot! It was hard to tell which one had the bigger sigh of relief. Congratulations to both Tom and Don. Well done. Mr. Ned Howard successfully passed his check ride with the Designated Pilot Examiner Mr. Brad Smith on February 1, 2017. Ned's instructor was Mr. Dennis Mathis. Way to go Ned! Congratulations. NO ! It's Erin Mastenbrook IN a plane and she is with the Designated PIlot Examiner and she is completing her checkride and she DID complete her checkride Thursday!! Congratulations are in order to Erin on achieving something not a whole lot of people do - becoming an FAA certified Private Pilot. Erin had a sterling day Thursday and is glad this long, tortuous process is finally over. She could write a book on how she became a Private Pilot!! She would probably start with her last instructor (well maybe not). Anyway, Erin is now a proud Private Pilot. Good job, Erin.